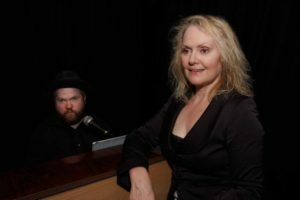 Helena Mulkerns sings Piaf or jazz to the accompaniment of Pianoman Josh Johnston in a regular evening of the arts known as The Cáca Milis Cabaret. She previously presented a similar (smaller scaled) event called “The Clumsy Cabaret” in New York at the famous Sin-é Café in the early 1990s, co-hosting with chanteuse Deanna Kirk and Elizabeth Logun and accompanied by author and musician Paul Hond. The Cáca Milis Cabaret is a multi-disciplinary evening that seeks to present a little of each of the Arts each time, somewhat in the spirit of old time Music Hall – with an emphasis on technical quality and artistic excellence. It has welcomed one and all, from emerging artists, musicians, dancers, comedians and short film makers to more established ones such as Eleanor McEvoy, Colm Tóibín, Dermot Bolger, Emer Martin, Jack L, Eoin Colfer, Louise O’Neill or Joe Rooney to name but a few.